The same day the Richmond Police Department in Virginia faced national scrutiny after an on-camera white officer threatened black middle schoolers that when they turn 18, “you’re mine,” the department announced a collaboration that will allow neighbors to turn the cameras on each other. The doorbell/video camera company Ring boasts a network powered through an app that allows neighbors to share information how to “stay ahead of local crime.” Richmond, Virginia’s police are now being offered free cameras by the company if enough residents download the company’s app. 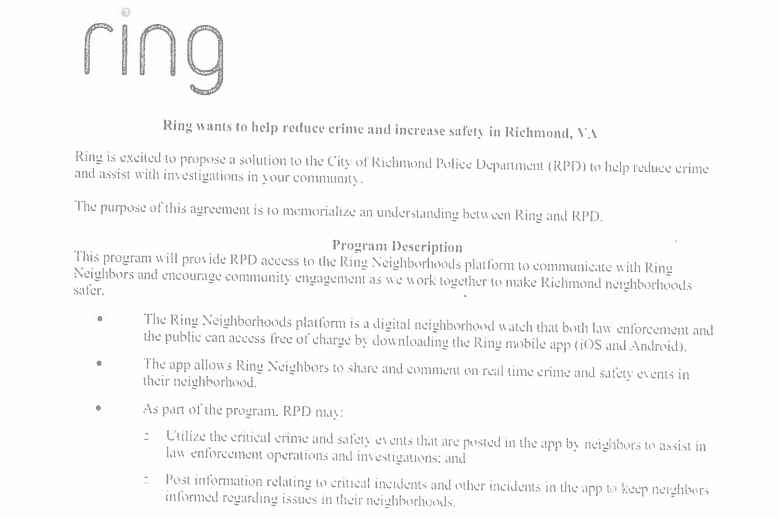 The agreement between RPD and Ring was released to MuckRock this week, the most substantial part of which is the breakdown of incentives. How these cameras will be distributed isn’t spelled out beyond being “with input from RPD.” MuckRock will continue to follow up. RPD asked for $5 for these two poorly-copied sheets of paper - though it should be noted that the invoice is crystal clear. News of this agreement also comes as the department slowly edges toward meeting the demands of the Richmond Transparency and Accountability Project, which has campaigned for the release of police data documenting the city’s policing. MuckRock will feature more about their work in the coming weeks. Read the full agreement embedded below, or on the request page.